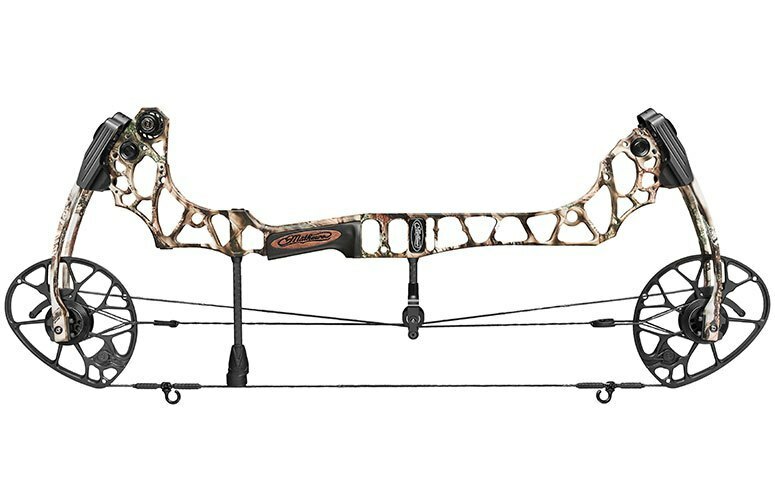 Outdoor GearIs the Mathews Triax the ultimate hunting bow? I know the word “compact” has been abused more than guitar picks at rock concerts in recent years, but it’s the adjective that jumped into my frontal lobe the instant I removed the Mathews Triax from its box. Although the Triax, at only 28 inches axle to axle, looks small, it’s also as beefy as a college fullback. The riser is thick (bridged top and bottom), and the limbs are wide and stout. Personally, I love the look. I also liked that my-new-for-2018 rig was cloaked in Optifade Subalpine. The limb bolts turned easily and produced no chattering or popping, and like every Mathews bow I’ve ever set up, tuning took a matter of minutes. In the end, I punched a trio of holes through paper. The Crosscentric Cam system rolls smoothly before breaking over, and though the breakover is a bit abrupt, it was by no means a jolt. Once the top and bottom stops contact the inner cable, the bow sits like a rock. I had the RockMods set at 75 percent setoff and found that at full draw the bow holds like a dream. Though the Crosscentric Cam system builds and holds an enormous amount of energy, the cams aren’t itching to unleash fury, a feature I really appreciated. I also noticed, even though I was in my garage punching arrows through paper, how maneuverable the bow felt at full draw. After achieving a perfect tear, I actually drew the bow, squatted down, took a knee, and then stood back up and fired another arrow. This bow moves extremely well with the shooter and can be held at full draw for a long period of time. On the outside range, my appreciation for the bow only increased. I thought it was quiet inside, but out in the open air the Triax proved graveyard-quiet. I know arrow weight plays into this, and I have no doubt my Easton FMJ 400s tipping the scale at 450 grains aided in that quiet shot. However, just for fun and the sake of testing, I fired a handful of 366-grain arrows downrange. Still super quiet. Of course, the Monkey Tails and thick, bridged riser play a role in the rig’s quiet nature, but the big story behind the silence is the newly added EHS (Enhanced Harmonic Stabilizer). Mathews calls it 3D Damping Technology, and it works. Protruding out and just beyond the bow’s bottom limb and housed in the riser itself, the EHS has been lengthened in all three axes from the point of contact — the grip — which drastically reduces noise and felt recoil. When it comes to felt vibration, you can forget about it. There is none. This bow was built for the bowhunting woods. It’s quiet and compact. Though I haven’t given the Triax a Hooter Shooter spin as of yet, I have shot field points and fixed and mechanical broadheads out to a distance of 100 yards. This bow is a tack driver, and though it’s short and features a 6-inch brace height, it seems ultra-forgiving. I credit this to the beefy riser design and the efficiency of the Crosscentric Cam system. In addition, the bow’s 4.4-pound weight (without attached accessories) aids in the balanced feel. On the range, at virtually every distance, I was stacking FMJ shafts. With my 450-grain arrows and at a draw length of 28.5 inches, speed was 286 fps. Yes, that’s a far cry from the advertised 343 fps. Was I surprised? Yes, but pleasantly. I have no doubt the Triax can hit 343 fps with lighter arrows and when set at a draw weight of 70 pounds and a draw length of 30.5 inches. I shoot heavy arrows, and I’m two inches below peak draw length. For me, 286 fps is sizzling. I can’t wait to tote the Triax into the spring woods on an upcoming Nebraska turkey hunt. I’ll be sure to let you know if my expectations are met. At this point, I’m pretty confident they will be. The Triax is offered in draw weights of 50, 60 and 70 pounds and draw lengths from 24.5 to 30.5 pounds (in half-inch increments).